The Korean website of Samsung gives us some information about a new digital camera. In Korea Samsung introduces their digital cameras under the name Kenox. In Europe or US we are familiar with the name Digimax. 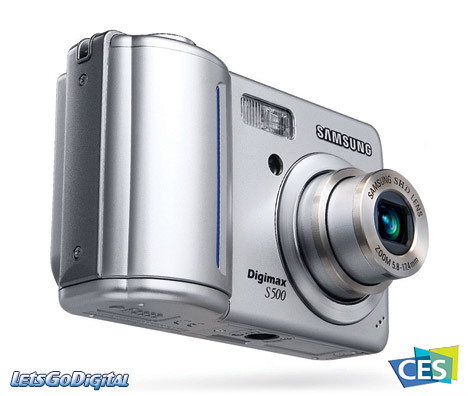 The Samsung Digimax S500 digital camera features a 5.3 Megapixel 1/2.5" CCD, effective resolution 5.1 Megapixels and 5,8 - 17,4mm (equivalent with film 35 mm: 35 - 105mm) zoom lens. The Samsung S500 is an entry level digital camera featuring Programmed EA metering, still images of 5 Megapixels with three compression settings (Super fine, Fine, Normal). Video clips with or without audio can be recorder in a resolution of 640 x 480 pixels (VGA) with a frame rate of 30fps. Samsung Digimax S500 - The new Samsung S500 camera has an internal storage capacity of approximately 20MB and features a Secure Digital slot for external storage. For power the Digimax S500 uses 2x AA format alkaline or NiMH type of batteries. The Digimax S500 has compact dimensions of 96.8 x 61.8 x 26.4mm and weighs only 136 g. The camera provides a macro mode (5cm) and focuses in normal mode from 80cm to infinity. The back of the camera features a 2.4 inch LCD monitor with a resolution of 112,00 pixels. 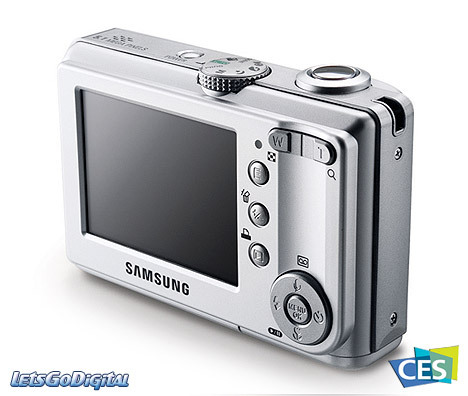 - 5.3 Megapixel CCD - 1/2.5"
The CES is the world's first event of the year. Meet the top keynote speakers live at the show. Share their ideas and get a look at the 2006 line-up. Expect to get the first facts and thoughts directly from the show floor. At 2006 International CES the digital imaging industry will warm up for the 2006 season. CES will kick off, the PMA 2006 will follow in February. Brands will come up with their new line of digital SLR cameras, digital compact cameras, digital video cameras, flash memory products, and multimedia solutions. Visit the most up-to-date online magazine of LetsGoDigital and learn more about the latest digital camera introductions, innovations and manufacturer's news. 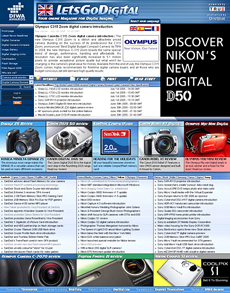 Weekly a digital review or exclusive preview of the most popular digital cameras is published. Be sure to read our daily news which is published in five editions. Meet our editors who are responsible for the English, Spanish, French, Dutch and Turkish editions. Up-to-date digital imaging news, a large camera database with more than 1,100+ digital camera specifications, digital image gallery and the LetsGoDigital forum. Visit and bookmark!